As a former English major who never performed very well in high school math, I was convinced that nothing—not even gamification—could help me be good at, let alone enjoy math. Then the Internet introduced me to Sal Khan and his online Khan Academy and turned my whole world upside-down. The Khan Academy is a free and has received backing from Google and The Bill and Melinda Gates Foundation. Led by the vision of Sal Khan, there is a collection online of 100 self paced exercises, 1,800 lessons and 2,100 videos. The subject matter ranges from traditional academic subjects like basic arithmetic, physics and organic chemistry but also covers historical events and complex current events like the credit crisis and the Geithner plan. In addition to this there are some curveballs like brainteasers, finance and test prep. The site is comprehensive, and if the Khan Academy was solely a free online curriculum for learning it would be impressive. What makes it mind-blowing is the way Sal has used game mechanics to make dizzying subjects accessible and yes, fun and addictive. 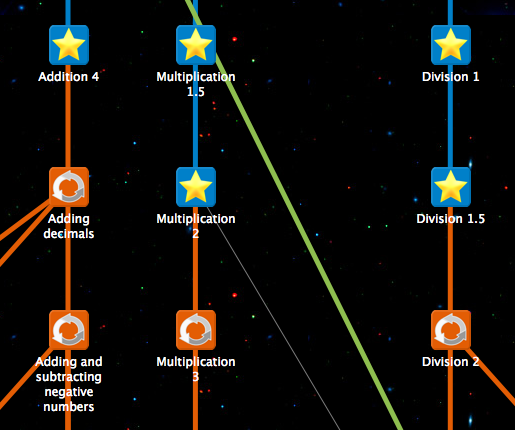 Khan Academy has introduced a few elements of gamification. First, subjects are all organized as a visual constellation on a Google map. The result looks a little bit like an RPG skill tree, and is organized so that lessons build off of one another. For example, Addition 1 branches off into Addition 2 and Subtraction 1. Keep in mind; this network extends all the way to differential calculus. The motivational effect of visualizing knowledge as a map and a physical space to be navigated and progressed through is undeniable. ‘Learning math’ becomes a series of logical and satisfying steps within a network and is suddenly transformed from a dull classroom exercise into the exciting prospect of leveling and progressive knowledge building. When you open up a challenge, the game rewards quick problem solving and ‘streaks’ of correct answers. Answer ten randomly generated problems within the subject? You pass. If you can’t figure out a subject you can sacrifice your streak count and get a hint, which solves the problem one step at a time, or watch the ten minute instructional video at no penalty. In addition, the Academy remembers and quantifies your progress every time you login. It converts your stats—such as your total energy points, how many minutes you’ve spent watching instructional video or completing exercises—into neat infographics. In addition you can access your progress within the galactically themed achievement system. So far I’ve collected four meteorite badges, each worth 100 energy points! Since the Khan Academy is 100% free and largely created by a small dedicated team, there are some gaps that I would love to see filled. Specifically, language progression and exercises in every subject, not just math. This is absolute barrel scraping though, even forgetting the fact that the academy is expanding every day. Sal Khan and his amazing Academy are proof that gamification principles can transform just about anything, including modern education and one Beowulf junkie’s relationship with calculus.